Queensland’s five year budgetary forecasts place its growth firmly at the top of the state leader board as its economy shifts gear. And that’s the rub, according to Deloitte Access Economics’ Director Natasha Doherty. “As the economy transitions from mining to embrace a more balanced future, it doesn’t yet feel buoyant; despite total employment increasing with 72,000 additional jobs, primarily in the service sectors, replacing the more than 20,000 jobs lost from the mining sector over the last two years. “It does take time for balanced growth to translate into jobs and generate a ‘feel good’ factor and boost spending within the State itself. In fact state demand has been steadily shrinking for more than two years, and it will take time to turn that around,” Doherty said. Despite the obvious challenge that the biggest driver of growth is exports – LNG exports in particular – there is every reason to be positive according to Doherty. “The economy is in better shape than many Queenslanders realise. 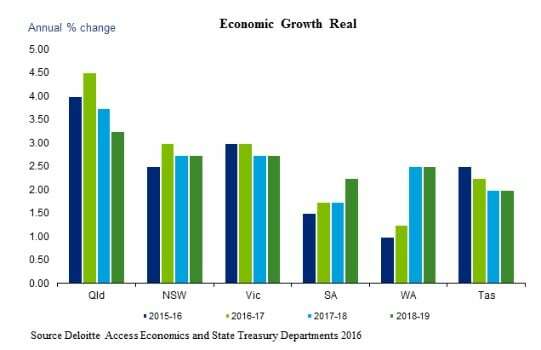 As Treasurer Curtis brought down his second budget aimed at building ‘investment, infrastructure and innovation’ for FY17, Queensland’s growth is projected to be comfortably faster than that of Australia as a whole, and the fastest of any of the states,” she said. Deloitte Queensland Public Sector leader, Graeme Newton said: “Queensland has the potential to build out its diversified economy and today’s injection of $225 million to bring the Government’s investment in its Advance Queensland initiative to $405mn is a good base. Added to this the government’s commitment to the cross river rail, the Regional Action Plan and connectivity across S.E. Queensland, and the road ahead will significantly improve. Deloitte Queensland Managing Partner John Greig added: “Investment in the knowledge economy is the insurance policy for our future. Business needs to engage and take advantage of the opportunities. I am confident that this budget is on the right track to encourage business investment, particularly for companies in the knowledge economy. The question we need to determine is, is it enough? “Business confidence will be an absolute key for realising jobs and growth and we need to ensure we have the right skills to make this happen. We will need to pull together to invest and grow these skills. As we pointed out in our Purpose of Place: reconsidered - the fifth edition of our Building the Lucky Country series - by collaborating to make place a driver of productivity and prosperity, Australia can unlock enormous potential. “In Queensland we have the opportunity to build a state where government, business, the research sector and communities join forces to develop a healthy, vibrant and more balanced future,” Greig said.